Jay Egge Automatic Service, Inc. is an independent family owned business that was founded by Jay Egge over forty years ago. We specialize in transmission repair and maintenance, as well as drivetrain components. Now owned and operated by Todd and Joanne Egge, the business continues to be based on quality service and provides repair on most automotive passenger vehicles, light trucks, SUV’s and diesel-powered trucks as well. Since opening in 1977, Jay Egge Automatic has grown from two employees to its current 14+ member staff with a state-of-the-art, 14,400 square feet building. Utilizing the latest diagnostic equipment, we perform over 80 repairs per week and work with all levels of clients from individuals to more than 400 resale customers. Jay Egge Automatic Service uses the Axilene DYNO to test all of their transmissions possible. 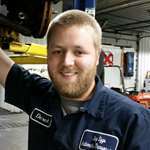 We are the only transmission business in the Sioux Falls area with a DYNO. Stop in and see the difference. Jay Egge Automatic Service is a member of ATSG, ATRA, ASA, BBB, the Sioux Falls Chamber of Commerce and the Brandon Chamber of Commerce. Call us today and see why so many customers have trusted their transmission to us. We use the Axilene DYNO to test our transmissions and are the only transmission business in the area with a DYNO. We Guarantee Our Work. We guarantee the work being done on your vehicle with a warranty of 12 months or 12,000 miles on the repairs performed. If you are not completely satisfied with your repair– for any reason – give us the time to find and fix the problems with any of our work at no additional charge. We Guarantee Great Service. We strive to make our service among the best in the area – friendly, responsive, and helpful. And we keep working to make it better and better. We guarantee that our staff will treat you with respect and courtesy AND treat you like a real human being. We Guarantee Turning Around Repairs in a Timely Manner. Our staff is understanding and respectful of your need for a vehicle and will do whatever is humanly possible to meet that need – turning around your repair as fast as possible. We Guarantee to Honor the Price Quoted. 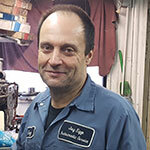 At Jay Egge Automatic Service, our word is our worth. The price we quoted is the price you’ll pay. Occasionally there are unforeseen repairs once we get into the job - If that happens, you’ll be quoted the additional charge before we continue the job. If you bring your vehicle in with a transmission problem we can’t resolve, you will not be charged. And we promise to return the transmission to its original condition at no cost to you if no internal problem is found. We Guarantee to Never Compromise our Standards. Jay Egge Automatic Service will never compromise its standards just to make a vehicle superficially driveable. We will never perform a low-quality service that would result in increased costs, inconvenience, and possible hazardous driving conditions for you. We will road test your car for free, and perform a FREE inspection using scan testing to determine your transmission problem. 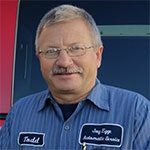 Todd and Joanne Egge have owned and operated Jay Egge Automatic Service since August of 1990. Todd started working at Jay Egge when his parents, Jay & Dorothy Egge, opened the business in 1977. He worked part-time while attending SDSU and after receiving his Bachelor of Science degree in Mechanical Engineering in December 1981, he began working full time at Jay Egge. Todd is currently a member of the Southeast Technical Institute (STI) Advisory Board. Joanne got the job without even applying. 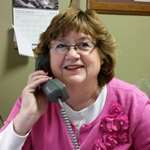 She is responsible for paying all the bills, the marketing & advertising and keeping the office running smoothly. Todd & Joanne have 2 children – Christina and Joseph. Joe is Todd and Joanne's son and on track to becoming the 3rd generation owner. His primary responsibilities are diagnostics and maintenance around the shop. He is the 1st Assistant Chief at the Split Rock Volunteer Fire Department. 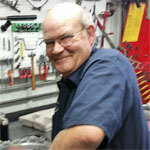 Dewey has retired after 40 years with Jay Egge Automatic Service. While he no longer works with us, we will always consider him a very special part of the Jay Egge Family. Happy retirement, Dewey! Greg Koch joined the Jay Egge team in April of 1995. 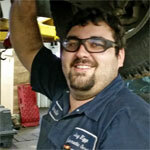 Greg is in charge of the daily vehicle diagnosis following each job through its completion. Greg and his wife have 4 children and are proud to now be “grandpa & grandma” to 4 adorable grandchildren. 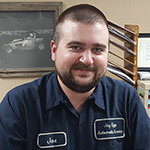 Lee Nichols has been part of the Jay Egge family since May of 2000. Lee primarily works with the Dyno machine testing transmissions before they go back into the vehicle, but also fills in where needed. Lee has a son and daughter and was recently married to Misty. Lee enjoys hunting and spending time camping with his family. 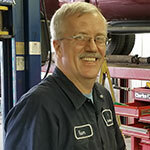 Bob Bessman is Jay Egge’s Parts man. 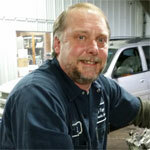 Bob began working at Jay Egge in October of 2006. During this time he acquired a wonderful wife as well. In December 2017, they had twins - a boy and a girl! When he’s not at Jay Egge, Bob spends his time hunting and golfing. And like most Jay Egge employees he is also a racing enthusiast. Derek Gramstad has worked at Jay Egge since November 2013. He studied Automotive Technology at Southeast Technical Institute. He married Alyssa in August 2016. In his free time, he enjoys snowmobiling and hunting. 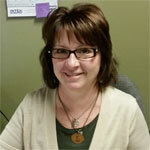 Leah Anderson is a part-time accountant and has been with Jay Egge since 2003. Leah enjoys being creative with paint and interior design, but tries not to be creative when it comes to accounting and tax matters. Leah and her husband volunteer for many organizations, but always seek to glorify God in their activities. 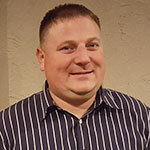 Charles Bresson has been working at Jay Egge since January of 2012. He graduated from Southeast Tech where he studied Auto Mechanics. He enjoys watching TV in his free time, playing a variety of sports and raising chickens. Terry Prouty began working for Jay Egge part-time while completing his education at Southeast Technical Institute. After graduation in 2005 Terry joined Jay Egge full-time in January 2006. In 2009 he went back to part-time so he could pursue a career in teaching. Terry owns and drives a racecar in the sportsman class. He is also a third generation mechanic, which comes in handy for repairing his racecar. 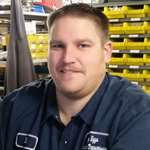 Ken Steffen started working at Jay Egge Automatic in January 2018 as a technician. Before working for Jay Egge, he worked at Bimbo Bakery in Sioux Falls for 34 years. Ken and his wife have 3 grown children and 2 grandsons. Whenever possible, he enjoys going camping. 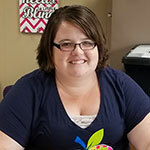 Sarah House began working part-time at Jay Egge Automatic as an office assistant and receptionist in the summer of 2014. She is in her final year at Augustana University and will graduate in May 2019 with degrees in Elementary and Special Education. Her free time consists of watching Netflix, hanging in her hammock, reading and spending time with family and friends. 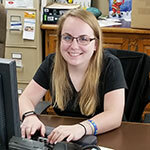 Casie McFarlane works part-time at Jay Egge Automatic as an office assistant and receptionist. She began working at Jay Egge in the summers starting in 2014. She is also a teacher working in the Sioux Falls Public School System while working at Jay Egge. Casie is a very talented cake decorator and also enjoys spending time with her nieces and nephews. 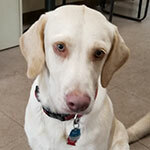 She is also related to Terry who works in the summer at Jay Egge. Chevy joined the Jay Egge workforce in November of 2017. She is another employee that did not apply for the position. Chevy greets our customers and keeps everyone entertained. She belongs to Joe Egge but she thinks highly of Todd as well.